Recently Arizona Audio Visual was approached by T.Y. Lin International to make their Tempe conference room more user friendly. The staff at this international engineering firm was using an existing flat screen monitor and an HDMI cable to connect to team member’s computers during meetings. Staff were complaining that the existing TV was too small for all of the meeting attendees to see and that they had to share an HDMI cable whenever anyone needed to put their content on the screen. They needed a solution that would allow multiple meeting attendees to present their data simultaneously without the need to connect directly. In addition, they wanted their staff to be able to connect to the screen using their smart devices that did not have a video output port. In other words they needed a technology that would allow any meeting attendee to connect to a screen wirelessly and they needed a much bigger screen for all to see. Arizona Audio Visual worked with Kramer Electronics on the wireless connection aspect of the project. We installed a Kramer VIA Campus wireless collaboration device to address all the T.Y. Lin’s connectivity issues. The Campus allows any meeting participant to wirelessly connect to the screen in the room by simply downloading the VIA app and signing into the meeting. Once signed in, up to 6 attendees can share their content on a single screen. The VIA Campus also includes several clever functions that make the meeting considerably more effective. These include the ability to see on your screen what others are presenting on the main screen, the ability to collaborate on screen images, and the ability to share files with the group. Arizona Audio visual also worked with Screen Innovations a Texas based video screen manufacturer who was honored by being chosen as the video screen provider for the International Space Station. We choose their 110” 5 series motorized screen which is located at the front of the conference room. Finally, to get a strong image for the screen we choose a Vivitek D963HD commercial video projector witch is mounted in the ceiling. 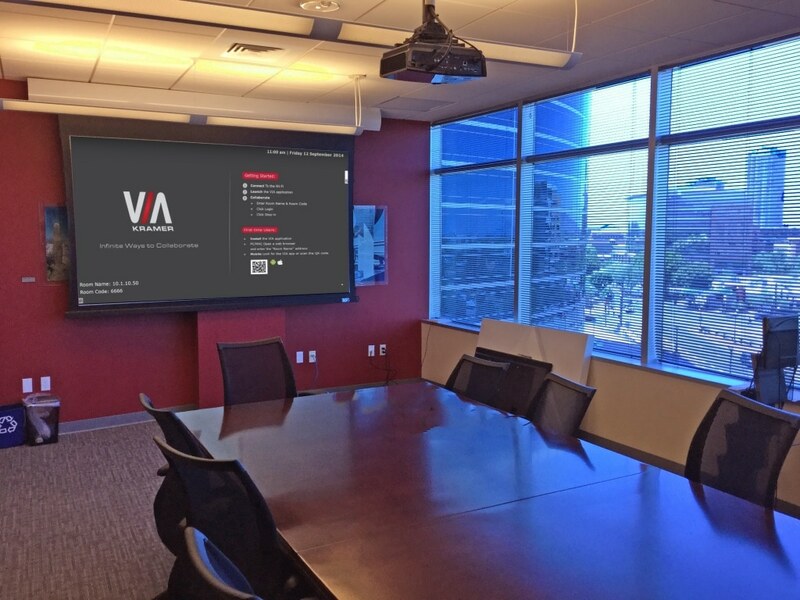 Conference Room With Vivitek Projector and Screen Innovations Motorized Screen. The VIA Campus Wireless Collaboration Device Home Page is Shown on the Screen. If you need increase productivity and ease of use at your place of business give us a call. We will be happy to visit your office and come up with some great ways for you and your staff to meet and collaborate better.